Ambassador Dayan Jayatilleka with Ambassador Riad Haddad. Sri Lankan Ambassador to Russia Dr. Dayan Jayatilleka paid a courtesy call to his Syrian counterpart Dr. Riad Haddad on January 14. Ambassador Jayatilleka congratulated Dr. Haddad for the series of decisive victories Syria had obtained in their war against terrorism. The Syrian Ambassador underscored that they managed to defeat terrorism in their country and defend themselves with the help of their people, leader, and army, as well as friendly countries; they drew victory in the war against terrorism supported by terrorist organisations from more than 80 countries. 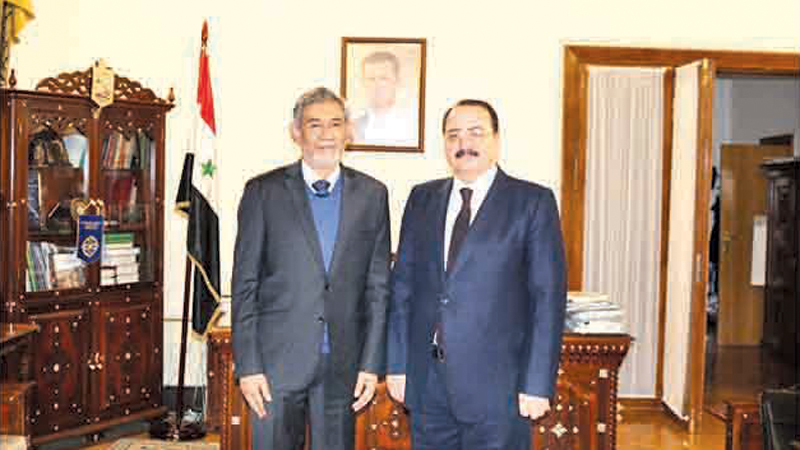 Ambassador Jayatilleka asked his counterpart about the post-war political project of Syria for its future to handle sovereignty and unity of the country and secure geographical borders, while managing calls for federalism. Ambassador Haddad said his country’s point of view was supportive of a political solution, but was firmly against federalisation. He said that though certain major powers wanted it, federalisation was not what the Syrian soldiers had died for. Ambassador Jayatilleka said Syria was a symbol of steadiness that has helped in restoring global equilibrium.